For the Smithsonian’s first-ever Kickstarter campaign, we are proud to announce plans to conserve, digitize, and display Neil Armstrong’s Apollo 11 spacesuit in time for this milestone anniversary. We want to preserve Armstrong’s spacesuit – and the story it tells of its incredible journey – down to the particles of lunar dust that cling to its surface. Just like the Apollo program, we will accomplish this in collaboration of [sic] thousands of people across the country and around the world. And that’s where you come in. Forty-six years ago today the first humans landed on the moon. Buzzfeed may have the scoop on how the moon walk was filmed. But, we have firsthand (or foot) knowledge of the historic event. I received no special training, however I went through an additional fire-prevention treatment to supplement the naturally resistant characteristics of my Nome fibers. I was assigned as the primary left sock of mission commander, Astronaut Neil Armstrong. However, during the preparations for the lunar E.V.A. 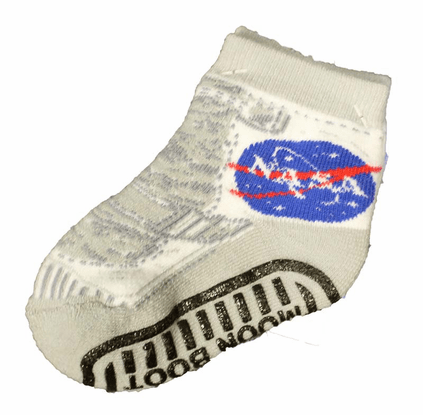 it was discovered that Astronaut Aldrin’s socks (both primary and reserve) had been left behind on Earth. Upon discovery, the astronauts consulted with Mission Control in Houston and it was decided that Astronaut Armstrong would give his primary socks to Buzz Aldrin. And so, Astronaut Armstrong’s back-up socks became the first socks on the moon, and I followed shortly afterward with Astronaut Aldrin. Excerpt from the official statement given by Neil Armstrong’s sock.